click HERE to return to the 3rd Ypres Menu page ... or HERE for the Gallery page of IWM photos. 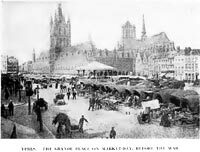 Before we begin let's just take a backward look at the mediaeval town of Ypres before the war began. 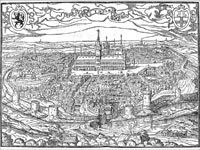 In this old engraving we can see the iconic cloth hall with its tall spire in the centre background, and the cathedral just behind. 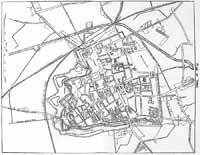 In the map, on the right, we can see the town plan from above ... the road leading from in front of the Cloth Hall and out of the town, over the canal bridge; the road the troops would take when leaving for the battlefield. In the photo on the left, taken in the years before WW1, the Cloth Hall is on the left and the cathedral on the right, in the background. In the foreground is the busy, everyday life of the town. In the photo on the right, taken in 1919 we see the ruins of the cloth hall on the right, and the catheral ruins to the left. The 3rd Battle of Ypres is often referred to as 'Passchendaele' ... two objectives of which were to take the high ground of the Menin Road Ridge, and the Passchendaele ridge ... both of which overlooked the Ypres salient ... a bulge in the allied front line ... a bit like a peninsula, except that, instead of having water on 3 sides it had enemy forces. The decision by Field Marshal Haig to attempt a breakthrough of the German line at this northerly end of the western front was taken in order to break out of the Ypres salient ... pushing on to the Belgian coast (about 20 miles from Ypres) and cutting off access for German forces, to the ports of Ostende and Zeebrugge, from which German shipping and u-boats operated. In addition, it would make the channel ports in allied hands more secure ... losing Dunkirk or Calais would cut off supplies and reinforcements to the allied forces in France and Flanders. An ambitious and optimistic undertaking to say the least. The Battle front would be a line about 15 miles long ... reaching from the River Lys in the south to just north of Boesinghe. and the ridge was secured during the next few days. The battle is variously considerd to have been finally concluded between the 10th and 20th November. HOWEVER, the 3rd Ypres has also to be seen in the context of General Plumer's successful, carefully planned and executed battle of the Messines Ridge, to the south of Ypres, from the 7th to 14th of June. During the 12 months before this battle 21 tunnels, each around a mile in length had been painstakingly and silently dug until they were up to, and 30 metres below, the German line. The 21 final chambers were filled with a total of over 4.5 million kgs, of fused explosives. The mines were detonated in the early hours of June 7th. 19 mines detonated. The 20th exploded in 1955 ... but the 21st remains lost. Thousands of Germans died and, in the attack that followed, thousands, dazed and shocked, surrendered to the allies. Attack and counter attack followed but a week later and the ridge had been secured by the allied forces. Five weeks of glorious summer weather would pass. 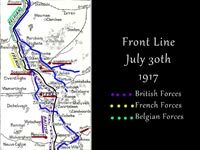 whilst allied troops and supplies were brought up to the front in preparation for the battle to break out of the salient. BUT it also allowed the German forces to re-group and, assessing the situation, make their own preparations for the anticipated assault on their line. 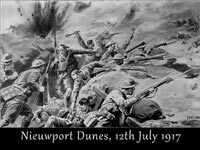 Also in the context ot the 3rd Ypres was the unexpected attack, by German forces, at the coast on the 12th of July. The British were defending a 'wedge-shaped' area, in the sandunes, between the Yser canal and the German lines, with the sea on their other side. 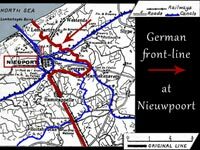 The position was reached by pontoon bridges linking it with Nieuwpoort and Nieuwpoort les Bains. On the 12th of July the British troops were subjected to barrages of heavy shells, the targets of which alternated hourly with their position on the east side of the canal and the supply positions on the other side. During this day-long barrage the troops were pinned down and the bridges were destroyed ... they had no means of escape or of outside communication. The German troops attacked in the early evening ... far outnumbering the allies, who defended their positions until almost all had been killed. Amongst this number was William Henry Montford ... a married man age 34, from Lees in Oldham ...who was in the 2nd Battalion Manchesters. A number of men were taken prisoner and a small number attempted to swim across the Yser ... but the majority drowned, weakened by wounds or exhaustion. 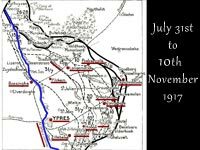 The 6th week, after the Battle of Messines Ridge, saw heavy rain which only stopped in the last couple of days of July ... pushing the date, for the allied planned offensive, forward by a couple of days. Within the period of the 3rd Ypres there were 8 distinct, all-out battles, aiming to secure the ridges to the east and south of Ypres. On this relief map we can see most of the Battle locations. There was no cessation of fighting between the actual battles ... with constant shelling, skirmishing, attack and counter-attack. During the intervening periods of time there was never any real respite and on the next map we can see how the line crept forward towards the objectives. Plus there were around 230,000 German casualties. Weighty books have been written recounting and analysing these battles and the short talk on which this account is based, can't do justice to them so I'm bringing everything back closer to home, here around Oldham. 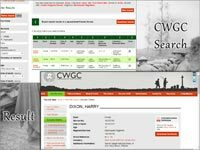 Searching the Commonwealth War Graves Commission websit (CWGC for short) with appropriate filters, I found about 250 local men. By local, I mean men from Oldham, Chadderton, Royton, Shaw, Failsworth and Saddleworth. I then cross referenced my findings with those recorded in two lever arch folders (here at the Oldham Local Studies & Archives) with names and details culled from newspaper reports. My thanks here are owed to Sue Smith, a member of staff here, who did the research several years ago, thereby saving me endless hours. 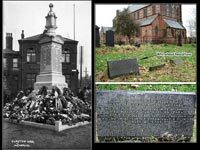 Altogether I now have the names of 427 men, including about 80 who were not local to our townships but were in one of the Oldham Battalions ie., the 10th and 24th Manchesters. Unfortunately, even so, the real number can't be known, as so many men didn't have a 'home location' in their 'Additional Information' on the CWGC website and / or were not reported in the newspaper or were seriously injured and hospitalised at a distance from the Ypres area, dying of their wounds at a later date. Consequently, none of those men can be positively identified in the searches. There were 3 Oldham battalions in the salient differing periods time during the months of the Battle. 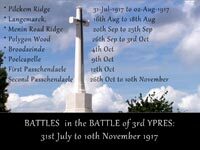 •	The 2nd/10th Battalion Manchester Regiment Initially they were only in the Ypres area from the 26th of September to the 11th October but returned in mid November, just as the Battle of 3rd Ypres was considered to be over. The 24th weren't a Battalion that 'went over the top'. Their role was as a pioneer battalion, mainly in support in the rear, doing anything and everything that was needed and, as the front line moved forward, bringing up supplies, digging out new trenches or repairing and making serviceable the old ones. The danger for these battalions lay in the fact that they were targets for enemy shelling, both when in the rear working (even some mining) and in the front line when working in trenches, laying tracks or duckboards. Their losses in this period numbered 26 men killed plus a considerable number wounded. 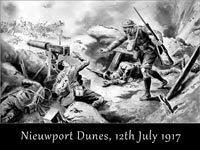 The 1/10th was in the Ypres area for just 3 weeks ... from the 1st of September until the 20th, when they left the salient and had arrived in La Panne by the 25th to undertake Coastal defence near Nieuwpoort, the area which had previously suffered the devastating attack in mid July. 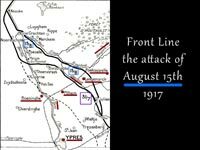 The front line remained more or less where it had been on the 12th July. The Germans hadn't moved their line to the banks of the Canal after the attack but had driven the British positions back to the other side of the canal. Their losses in September numbered 13 men killed. Walter Mills, one of Oldham's 3 soldiers who were awarded the Victoria Cross, served in this battalion. His life would be lost just a few weeks later, near Givenchy. 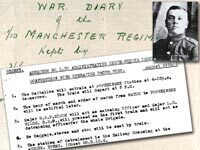 I'm still in the process of transcribing their war diaries for this period but on the website HERE you will find an account of their experiences throughout the war as recounted by Sergeant Maurice Bradbury MM and published in instalments in the 'Oldham Standard'. By 1917, the soldiers in both the 24th and the 10th Battalions, were no longer all from Oldham. 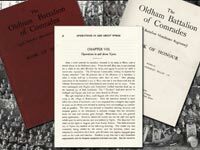 Soldiers sent out in the drafts, to bring the front line battalions back up to strength, were frequently conscripts, not only from Oldham but from other areas of Lancashire and even further afield. They now included men who had failed to get exemption from Tribunal boards and even men who, in the earlier part of the war, had been deemed physically unfit for active duty. The 2nd and 3/10th Battalions were the training Battalions, remaining in England ... BUT, there was now an urgent need for soldiers in France after the terrible losses on the Somme in 1916.
it was in those weeks that 4 of the Battles for Passchendaele took place. Finally, there were the local men who enlisted in, or were drafted into, any number of other regiments, adding a further 330 or so local men who were identified as killed. But it's not hard to imagine how many more were seriously wounded and / or died elsewhere, probably a very great number. My own particular interest in this Battle stems from the fact that my great uncle, Edward Garside Whitehead, fell on the first day of the battle and, with no known grave, is remembered on the Menin Gate Memorial. Edward was the 7th child of the 10 children of James Edward Whitehead and his wife Martha (nee Garside), all of whom survived into adulthood. He was their 2nd son. 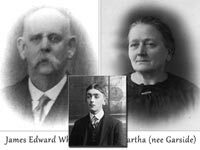 Although living in Clayton by 1911, the Whitehead family had very strong Oldham connections. On his mother's side he was a Garside and was descended from Gartsides who lived in Bleakhey, Delph. On his father's side, he was descended from the Steeple farming family who came to Oldham from Derbyshire in 1792. 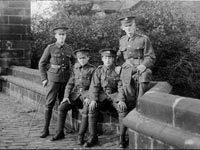 By the time of Christmas 1914 it was clear the war was going to be more lengthy than most had anticipated and in January 1915, age19, Edward decided to enlist, and did so in Hollinwood. 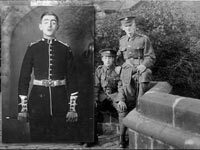 In the photo Edward is on the right ... the cap badges of the other soldiers are all of different regiments. The Whiteheads were a tall family ... fairly unusual in those times and Edward was 6ft. tall, as was his older brother and one of his sisters, my own grandmother. He enlisted in the Grenadier Guards ... Why? The regular Grenadier Guards Battalions had just suffered a severe mauling in the opening battles of the war and they needed recruits urgently. It might have been suggested that he join the Grenadiers because he was tall ... Grenadiers had a minimum height restriction and a number of local men, possibly known to him, had already joined the guards and might have encouraged him to do likewise. All conjecture ... but no proof! and be placed in the newly created 4th Battalion. 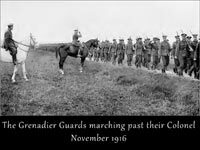 Like most of the early volunteers for the army, the recruits would be in training until late summer of 1915, and Edward was no exception. 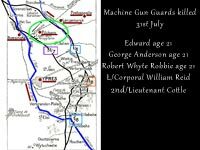 In that summer of 1915 the 5 Guards regiments were brought together to form their own Division, with 3 Brigades of mixed Guards battalions, each of which had its own Machine Gun Company which Edward would later join. It took me a while to realise that the Machine Gun Guards is a completely separate unit from the Machine Gun Corps (or Company which was deployed across the rest of the British forces. The Machine Gun Guards were kept within their own Guards Division ... useful for we family historians as their movements can be tracked more easily. Edward landed in France on the 5th October 1915 and on the 9th he arrived, with his 4th Battalion draft of 290 men, at Vermelles on the Western Front where the Battle of Loos had been raging and the Guards Division were in the thick of the fighting, sustaining heavy casualties. I don't know exactly when Edward was put on machine guns, but the photo of him in on the left, has the Machine Gun Guards insignia on his epaulettes and his collar and is dated on the back, 3rd October 1916. His number, in the 4th Battalion Machine Gun Guards was 385, and he was in No. 2 Company.. Both Lewis guns, and the Vickers guns were in use but the M-G Guards would be using the heavier Vickers gun, and Edward would have been part of a team..
After a period of training in England, the newly created 4th Machine Gun Guards Company arrived to join the Guards Division, on the Western Front in March 1917 as events leading up to the Battle of Messines Ridge were unfolding, preparatory to Haig's ambitious 'Big Push' in the Ypres Salient. In April the four M-G Guards Companies were brought together as one unit for the Division, instead of being attached to each Brigade. In Mid June, just a few weeks later, the Guards Division were moved up to the Ypres area. The next 5 weeks saw glorious weather, as preparations gathered momentum and the Enemy forces shelled the salient repeatedly, including shells which brought the added horror of mustard gas. Almost 17,000 men were gassed, of whom 600 died. Finally, in the early hours around dawn, of 31st July, the Allied offensive was launched over the already waterlogged ground. Initially, the Guards made good progress towards their objective although suffering significant losses. The 2nd Battalion had, as their first objective, the crossing of the Steenbeck river. German machine-gun fire, from the village of Langemarck, was making it an almost impossible task. "the section of the Machine Gun Company which followed the 2nd Battalion during this advance suffered very much from shell-fire. Lieut. Cottle, the Officer in Command, was killed whilst going forward to reconnoitre and, shortly afterwards, one of the guns of this section with its entire team ... was knocked out by a shell." The green ellipse shows the area in which this took place. This, I believe, was my Great Uncle Edward's team. His name is on the Menin Gate Memorial, alongside that of George Anderson. D,G,M, Anderson (with them on the memorial) was killed in acttion 6 days later. Robert Whyte Robbie and William Reid were both buried in Artillery Wood Cemetery. 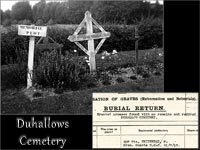 ''Erected crosses were found with no remains and removed to Duhallows Cemetery"
The photo on the left was taken when my grandmother and great aunt visited the war graves in the early 1920s. He is also remembered on the War Memorial in Clayton and on the headstone of his parents' grave in St. Cross Graveyard, Clayton. 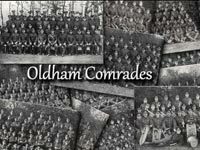 The Oldham Battalions might be running short of local men but there was no shortage of them in other regiments. A good majority of those were in one or other of the Manchester and Lancashire Regiments with a fair few in the Duke of Wellington's (West Riding) Regiment. He was 19 years old and lived on Bishop street in Oldham. He had enlisted under the Derby Scheme in September 1916. He was a junior reporter on the Oldham Standard and the 3rd local junior reporter to be killed, to date. * Sapper Charles Wilfred Smith in the Royal Engineers, age 30, who left a widow and 2 children. He was a sapper with the 200th Field company, Royal Engineers, service No. 487039. He Had enlisted in May 1916 and was one of 3 brothers, all serving. His father was a florist with a business in Oldham's Victoria Market, and himself had a business as a fruiterer and florist. He was killed by the concussion from a shell, not by shrapnel, landing just behind the front line as his party was going out to work on the night of the 31st. * Lance/Cpl Frank Travis, age 24, who was killed on the 4th. Frank was unmarried, living on West End Street, and had worked at Platt's New Works before the war.He had been invalided home with dysentry and shell shock in early 1917 and only returned to the front in April. * A day later, on the 5th, Captain Roy Bowes, MC, age 23 was killed. Roy Bowes had lived on Oldham Road in Failsworth, with his parents. On the 1911 census his father was described as a 'physician & surgeon' and Roy as a 'student of architecture'. From that first battle, lasting just 3 days there were almost 32,000 British casualties - dead and wounded. The first day of August had seen the rains start again and they continued until, by the middle of August, roads were quagmires and the shell holes of the salient were filled with water that was more like a thick, sticky, glutinous soup; undrained and with any number of unseen horrors lying beneath the surface. Still in August, and there were 72 more local deaths before the end of the month. The next all-out attack became known as the Battle of Langemarck, 16th Aug to18th Aug, and was a disaster; ill-fated from the first, as the soldiers went into a desperate, costly attack ... in horrific, drenching conditions they foundered in the mud and slime as the heavens opened yet again. 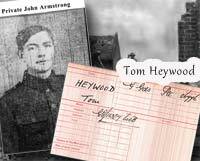 * On the 16th, Private John Armstrong age 23, lost his life along with another 11 men, including Tom Heywood, within the next two weeks. John, who lived at 3, Sand Hole, Royton, had enlisted in August 1914 and had served on the Western Front, and then in the fighting at Suvla Bay, on Gallipoli. He was evacuated with his battalion in December 1915, then serving in Egypt before returning to France and Flanders. * Tom Heywood, age 19, was a Grenadier Guardsman. Born in Clarksfield, Tom lived on Sharples Hall Street, in Oldham. On the 1911 census he is shown as one of 6 brothers - 2 older and 3 younger. He was described as a paper tube maker. General Gough, with his overly ambitious planning, had failed to deliver a victory at Langemarck and was replaced by the more cautious General Plumer (who had masterminded the Battle of Messines) and whose tactics were to make smaller gains but hold on to them - 'bite and hold'. In the first 18 days of September, 32 men died, including * Joseph Eric Sellers, age 27, in the Manchester Regiment and atttached to the Royal Engineers. Joseph had lived on Ashworth Street, in Shaw. Before enlisting under the Derby Scheme in November 1915, Joseph had worked as Secretary of the Crompton Spinning Company but, following a breakdown, had found employment as a sorting clerk and telegraphist at Oldham Post Office. * Rifleman Tom Schofield, age 25 lived on Shaw Road, Luzley Brook, in Royton. After enlisting in 1915, he worked as a special policeman at Sheerness Station and had only been on active service for 2 months when he was killed. William, his older brother, had been killed in action in August 1916. * Lance/Cpl. John William Beeley was age 36. In 1914, John was a reservist, called up when war broke out, and was on active service in France by the beginning of 1915. He served in France, and was wounded twice before being sent to Egypt in 1916 then back to France and Flanders in 1917. He was a married man and lived on Old Road, in Failsworth. He had been home on leave only a month previously. 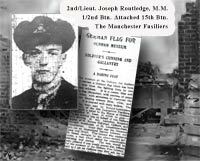 * 2nd/Lt Joseph Routledge MM, was age 22 when he was killed. He had lived on Landsdown Road, in Chadderton. In 1916 when he was a sergeant, he had been recommended for the DCM. Whilst still a sergeant, he and sergeant Rigby, from Salem, had captured a 'Bavarian flag' from enemy lines and then presented it to the Oldham Library. He was killed by a shell whilst attempting to help an injured man. * Cpl.Thomas Owen Jones, age 30, and in the Welsh Regt., 9th Bn., was not a local man by birth. He had come to Oldham as a three-quarter back for Oldham RFC. He was killed in a bombing raid. * George Baron, of Royton, who was also in the Welsh Regt., 9th Bn. * Alfred Thomas Stevens, in the King's Own (Royal Lancaster) Rgt. He was a married man of 23. A letter received by his wife states that all the officers of his company were either killed or wounded, as the 'men were in an advance over the open'. * Lance/Cpl. James W Shepherd age 30, in the Machine Gun Corps (Infantry) 228th Coy. He was age 30 and from Shaw. Hehad originally eblisted in the Manchester Rgt. before transferring to the Machine Gun Corps.He was in charge of a vickers machine gun and was killed instantly as an enemy shell landed on the gun. * Gunner William Ogden age 39, in the Royal Garrison Artillery ,278th Siege Bty. An Oldhamer, William had married Florrie, of Alberta, Calgary, in Canada. At the time of his death she was living in Oldham with their two children. *James Wrigley age 25, was in the royal Garrison Artillery, 289th Siege Battery. He came from Lees in Oldham. *2nd Lt. William Holden Hall age 28,who was in the Royal Field Artillery, 'D' battery, 51sr Bde. His family home was in Royton and, with a degree from Oxford, had gone of to qualify as a Barrister-at-Law. *Fred Iredale age 29 was in the Royal Flying Corps, 29th Sqdn. He was married and lived in Hollinwood. *Cpl. Stafford Charles Mort age 37 was in the Royal Engineers, 429th Fileld Coy., and had previously been mentioned in dispatches. He had been a married man and his wife was living in Oldham. *Thomas Shaw age 28 was in the Lancashire Fusiliers 9th Bn. He was a married man and came from Oldham. 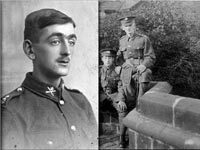 *Benjamin Stott age 20 was in the Manchester Rgt., 22nd Battalion and from Oldham. 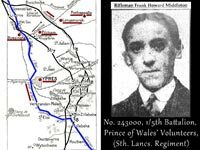 *William Freeman age 34 who was in the Lancashire fusiliers, 2nd/7th Battalion. He lived in Werneth, in Oldham. *Lance/Cpl. Samuel Rhodes age 19 who was in the Grenadier Guuards, 2nd Battalion. and was alos from Werenth. *Albert Victor Nutbrown age 20 was a sapper in the Royal Engineers, 66th Div. Signal Coy. He was from Chadderton. *Trooper Frank Rathbone age 23 was in the Household Battalion. He lived with his parents in Shaw. *Joseph Franklin Kershaw age 33 was in the Machine-Gun Corps, 126th Coy. He was an Oldham man, and an artist by profession. *Arthur Hirst age 25 was in the RAMC, 56th Field Ambulance and from Oldham. 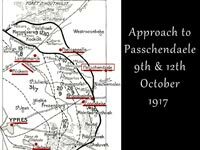 The 2nd Battle of Passchendaele, began on the 26th October and lasted until the village fell to Canadian Forces on the 6th November. The allies gained possession of the ridge by the 10th. *Horace Pemberton, MM, age 20 was in the Manchester Rgt., 22nd Bn. From Oldham, he is remembered on the Tyne Cot Memorial. *William Ashton age 23 was in the Royal Field Artillery, 'A' Battery, 311th Bde. He was from Failsowrth and had enlisted on the 7th September 1914. 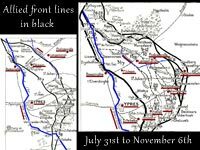 Looking at the 2 maps we can see how the allied front line, a couple of miles beyond Ypres, was gradually pushed forward, for about another 5 miles towards the Germans, in the direction of Passchendaele village. It took 3 and a half months of continuous attrition, to achieve a distance, to the furthest point, of about 5 miles ... much less on other sections of the approximately 15 mile line. Looking back at local men in the 'Comrades Battalion' we see that 25 men of the 24th are recorded as having died and been buried or remembered, in this sector, between 30th August when they arrived and 11th November when they left. 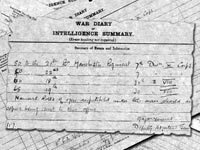 11 casualties are shown in the War Diaries and would include *John Pendlebury and *Herbert Turner, both from Oldham and age 35, who were amongst the 6 resultant deaths. On the following day they were ordered to rejoin the 7th Division and were billeted at Hazebrouk. This was behind the lines and the next 10 days or so were fairly uneventful with the routine maintenance work of a Pioneer Battalion, inspections and even a football match on the 17th, at Wizernes. They played against the 23rd Field Ambulance and the Comrades won 3 nil. 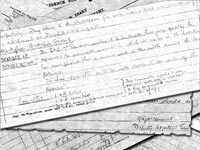 By the 24th of September the men were back nearer the front line and were constructing a plank road in Sanctuary Wood ... the War diaries tell us there were 6 casualties. The same work was continued for several days, with such comments as, "it was slow work as materials had to be carried a long way from the dump," and, "there was hostile artillery barrage". Conditions were bad with little or no hot food, knee-deep mud, and the interminable shelling. *James Henry Davies age 31, *Cecil Dan Dunham age 22 and *Sam Brocklehurst. "Message of Appreciation : The G.O.C. 7th Division wished it to be known how very greatly he appreciates the admirable manner in which all ranks in the Battalion have accomplished their arduous work in the sector during the last fortnight. The above appreciation is to be made known to all ranks of the Battalion." and in recognition, Lt. Ernest Wood would be awarded the Military Cross, Cpl. Albert Dixon a Bar to his Miliary Medal and 5 other soldiers the Military Medal. But on the 13th they got the demoralising notice that 113 men were to be transferred to other battalions and be replaced by 114 ex-Royal Engineers. The following day the 24th received further notice that another 265 men were to be transferred and be deployed to another 4 Manchester battalions. Were they so good at what they did, and totally reliable, that there expertise had to be shared with other battalions? Whatever the reason, this all led to urgent and angy exchanges between the Battalion CO and his superior officer but apparently to no avail and the first group of transfers left the Battalion. However, circumstances must have changed as, the following day, new orders came that some of the transfers were to be delayed. A new intake was absorbed, replacing those who had already left and work continued routinely until the 1st of November. Thomas Henry Fardell age 36, a married man and also from Oldham. Soon after, at the beginning of November, the 24th were moved to Ascot Camp, Westoutre where there was re-organisation and inspection of the Companies, followed by several days of training then back to routine work. On the 11th November they received the order to entrain at Ouderdom thereby beginning their long journey to Italy, where they would spend the remainder of the war. 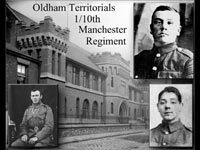 Of the Oldham Battalions, The 1st/10th Manchesters, were in the salient for the shortest period of time. The Oldham Territorials had arrived at Watau, near Ypres, from the area of the Somme, on the 1st of September. 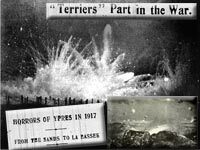 Initially, there were a few days of intensive training ie., how to storm concrete emplacements, all of which was carried out against a disconcerting background of roaring guns, night-time flares, ambulances and the rumble of limbers. 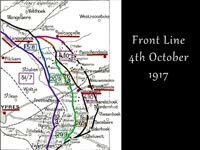 "The battalion had about 16 days in this sector in and out of the line ... and the work was chiefly preparing for the October offensive which began a day or two after the brigade was relieved by the Australians ... "
The 10th had known what to expect. Awareness of the results of a month of disastrous campaigning had left names burned into their minds ... Hell Fire Corner, Shrapnel Corner and Menin Road Ridge ... conjuring up the horrifying images of mud, shelling and death. They could only hope to endure; and somehow survive the appalling misery. On the 5th of September it was their turn to move to the Front. 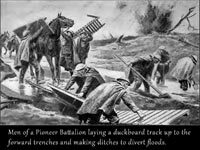 They trudged through the mud towards Railway Wood, carrying rations and shells to forward posts, and carry out more work on the duckboard tracks. It would be their job, not to fight, but to prepare the sector for a later offensive - but that just made them the target for German gunners. *Granville Rourke age 24, who was from Werneth, Oldham. * James Pollitt, age 25 from Chadderton. *Reuben Crompton age 22 , who was also a Chadderton man. 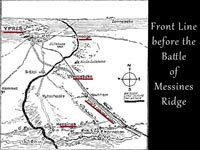 The Battalion left the Salient on the 20th September with relief but, as Bradbury wrote, also with a feeling of "flatness"
"No relief was more welcome. than that at Ypres. The battalion had been in many hotter places but it was the general atmosphere of 'Wipers' which was so depressing and the fact that the fighting was on exactly the same ground as it was in the early days of the war." 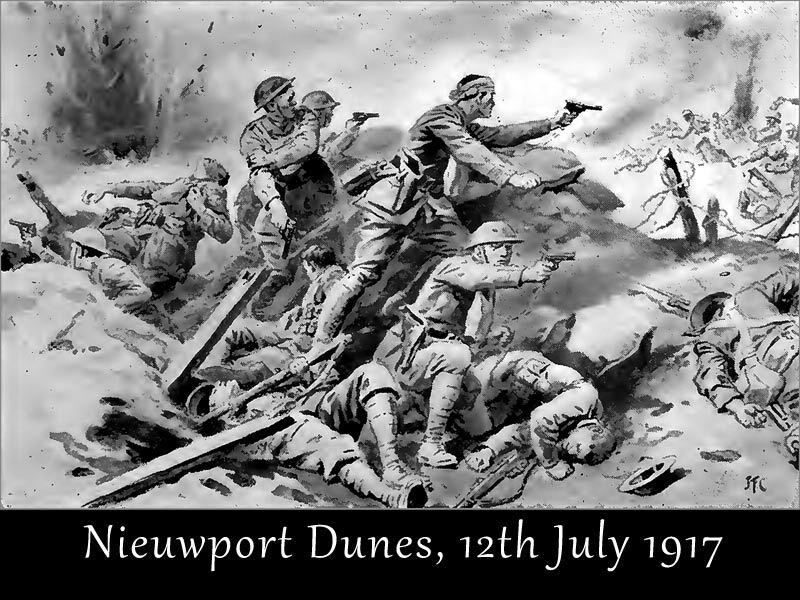 After this, the battalion was redeployed to Coastal defence at Nieuwpoort, relieving the 2nd/10th Manchester. As mentioned before, the front line remained more or less where it had been on the 12th July ... the Germans didn't move their line to the banks of the Canal after the attack but drove the British back to the other side. "There were many meetings of friends and relatives ... and for a couple of days both battalions had a really good time in La Panne. It was scarcely conceivable that a few miles up the coast was the front line and that if he desired the Boche could drop his shells anywhere in the town "
"The front line in the coast section was not so 'cushy' as the men had thought it would prove and at times it became exceedingly rough. There was not much chance of any surprise attack here from either side considering that No Man's Land was always flooded and men going on patrol had to swim canals. The work was chiefly that of of improving the defences and contained all the usual routine of trench life. " 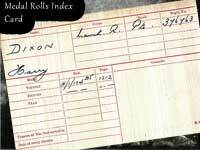 *Frederick Robinson, a married man age 27 who'd been employed at Bodden's Spindle Works prior to the war was killed by a stray shell on the 25th. He'd enlisted in the Territorials in August 1914 and had served in Egypt, presumably also in Gallipoli with the Battalion, and then on the Western Front. He had a brother, also in the Manchesters, who wrote home to say that he had made sure that his brother was buried decently. *James T. Mason age 37, on the 8th of November. He was a married man, from Chadderton, with 2 children. In total, the battalion had lost 13 men, 9 of whom were local. 350 of their original, local recruits were drafted out to join another battalion on the Somme where there was such a desperate need for more troops. This brought the number of volunteers from the Oldham and local townships down to just 300 men between the 2nd and 3rd battalions. The deployment of the 2nd/10th, to France, had seemed imminent but, as it turned out, they were kept in training at Colchester until early March 1917 when they entrained for Southampton ... destination the Western Front and the La Bassee area. Their turn for the Front line came in mid March 1917. They were never required to 'go over the top', or carry out raids on the enemy lines, but, even so, 2 men were killed on their first night in the trenches. By June, another 17 men had died and a significant number been injured. Two large drafts of men brought their numbers up to the 750 level but few of the new men were from Oldham itself. 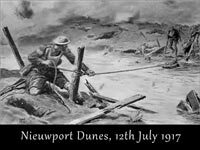 It was in June that they moved to coastal defence duties near Nieuwpoort and again, there were a number of casualties through enemy action. It was here, on the 15th September, that Sgt. Archbold lost his life in an exploit that went badly wrong. He, with another soldier planned to place an allied flag on a jetty on the German side of the Yser Canal. The first attempt failed because the current was so strong. The following night their second attempt became a disaster when the the lifeline, attached to Sgt. Archbold by comrades on the 'home side' of the canal bank, became detached and he was lost. 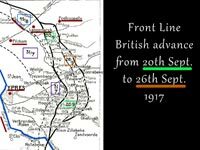 On the 23rd September the 1st/10th arrived from the Salient to relieve the 2nd/10th, and soon it was the turn of the 2nd 10th to march off and take their own place in the now infamous Salient. On arrival, in the first few days of October, the battalion 'camped' in a field although 'camped' hardly describes the situation as there were no tents, no shelter and just a wasteland of shell holes filled to overflowing with mud and unburied bodies beneath the suface. And it was raining ... there was no hot food, nowhere to attempt a makeshift brew. There they sat and shivered, half drowned, for the next 24 hours. The following nights they were with working parties, laying duckboards and track mats, and carrying stores and equipment. It was on the 7th that *Sgt. Herbert Cecil Mills, age 22, was killed. he was a married man age 22, from Oldham. On the evening of the 8th, the heavily laden men of the 2nd/10th battalion lined up, with the rest of the Brigade, to march up to the front where they were to be in support of the two Battalions of the East Lancashires who were to lead the attack in their sector in what became known as the Battle of Poelcapelle. Progress was painfully slow, too slow, and for 11 hours they struggled foward as shells rained down on them and the shattered duckboards had to be repaired constantly before they could move on again towards the ridge. When they finally neared the attack area, the covering barrage had been lost and, even worse, 'friendly' shells began to land around the battalion. Beyond all endurance the troops waded further, across marshy ground then, unable to go on, they came to a halt, sinking into what little cover they could find. All around them shells continued to fall and enemy machine- guns set up a barrage on their positions. There they endured for two days, with shrapnel raining down on them, machine guns targeting any likely cover, and with no fresh food or water. *Cpl. Robert Hill, age 26 from Hollinwood. *Charles Ellis Smethurst, age 20 from Oldham. *Alfred Heald, age 27, from Oldham. *Cpl. William Monkhouse age 22 from Longsight, Oldham. *Nicholas Dyer age 20 from Royton. Eventually, on the 11th/12th of October, the Australian troops moved up to relieve the survivors of the 66th Division. and it was the 17th of October before the men were allowed to march to the rear for rest and re-organisation. The 2/10th Battalion had suffered around 250 casualties, at least 53 of whom died and, seemingly, without firing a gun in anger or ever being anything other than 'sitting ducks' for enemy target practice. Many of their dead have no known grave ... they disappeared into the morass that was the battle ground of the Salient. 15 men in the Battalion would be awarded the Military Medal, and 4 were awarded the Military Cross for their bravery and tenacity, including *Captain G. Fripp, the son of an Oldham solicitor. 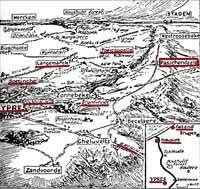 The batttalion would then entrain for St Omer, leaving the salient behind for more training, re-fitting, and absorbing a new draft. The battalion had lost 400 men, since their arrival in France, either killed, wounded or sick. However, the Battalion would be returning to the Salient once more, only a month later, to face the misery of that coming winter. In the 3 and a half months, of this Battle of 3rd Ypres, there were around a quarter of a million allied casualties ... over 370 local men in diverse regiments died, plus around another 100 local men serving in the 10th and 24th Manchester (Oldham) Battalions. or use their gains as a jumping off point for further advances. The greatest, and saddest irony is that, only five months later, almost all of the ground gained was recaptured by the German Army during their Spring offensive in 1918. 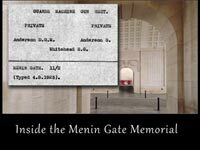 The names of almost 55,000 soldiers who fell in the salient, before the 16th August 1917, and have no known grave, are to be found engraved on the panels of the Menin Gate Memorial which was opened in 1927. And today, a picture reflecting tranquility, taken from that same road out of town which saw so many thousands march along it .... never to return. on the Memorial Wall are the names of 34,000 men who fell in the salient from mid August to November 1917, and have no known grave. 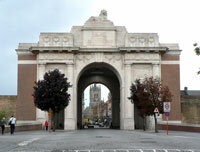 Ypres was lovingly restored after the war and rose like a phoenix from the ashes, new born. When the church was rebuilt in 1928, the people of Lancashire donated money for a stained glass window to commemorate the Lancashire men who died there. The photo is the detail from the middle window depicting St. George, England's patron saint. Oldham men who died at Ypres. With my grateful thanks to Denise North for allowing me to use her photos of modern Ypres.